People use Uber because it’s convenient, easy and considered less expensive than traditional taxis. But how much cheaper is UberX — the company’s low-cost option — than a cab in Canadian cities? As it turns out, it depends a lot on which city you live in. Ever since Uber arrived in Toronto in 2012, the company has expanded rapidly, now operating in ten Canadian cities, the newest of which is Calgary, which is enjoying its first month of service. The company accumulated its share of controversy over the past three years, as taxi companies, which must offer metered fares set at the municipal level, are struggling to compete with a business model that many see as a cheaper, faster, and more pleasant way to get a ride across town quickly. In most Canadian cities with UberX, our study shows that the company charges between 30% and 50% less than what a taxi would charge for the identical route. Toronto, Ottawa and Montreal see the largest gain in picking Uber over a taxi, where customers save 50%, 44% and 41% of what their average taxi fare would be, respectively. 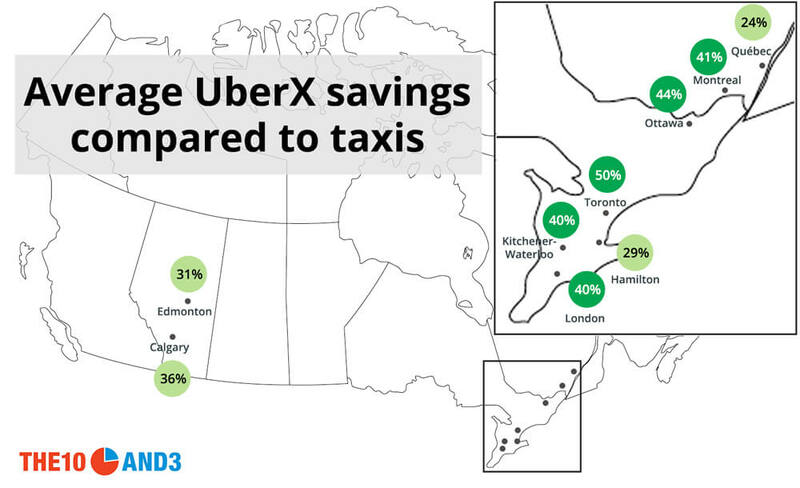 On the other end, Quebec City (24%) and Hamilton (29%) see the smallest savings compared to the equivalent cab fare. Short routes around the city tend to offer slightly smaller savings than longer routes. This is due to the different pricing structure of the two services; whereas taxis typically charge a sizable per-distance rate plus a small per-minute rate when in stopped or slow traffic, Uber typically charges a smaller per-distance rate plus a standard per-minute rate (regardless of speed). As a consequence, longer high-speed routes (for example, along the highway to the airport) are even more cost effective on Uber. What allows Uber to offer such deep discounts in some Canadian cities while providing more modest savings in others? One theory is that taxi prices may be so exorbitantly high in places like Toronto, Ottawa and Montreal, that Uber can easily afford to undercut taxi rates by 40-50% without breaking a sweat. Indeed, the data appears to bear this out: Toronto’s taxi rates are among the highest in the world (even after the recent $1 reduction in base fare), followed closely by — you guessed it — Ottawa and Montreal. Another theory is that Uber is strategically selecting large markets in which they aggressively pursue market share by offering rock-bottom prices; the company has been known to dip into its deep coffers to keep drivers on the road (for example, by paying their tickets). In Toronto, at least, the company appears to have succeeded in building an impressive market share. Uber isn’t always the best choice over a cab, however, especially when taking it during its surge pricing. In order to encourage more Uber drivers to take to the streets during high demand times, like when a Blue Jays or Canadiens game lets out or when public transit shuts down, fare prices can rise substantially. Each city has a unique point at which Uber fares need to rise before it becomes cheaper to hail a cab – in Toronto and Ottawa, it is roughly when fares are doubled, but in other Canadian cities it can be slightly less. As a rule of thumb, when surge prices pass the 2x mark, begin looking for a cab; unlike Uber, taxi rates remain the same, regardless of how busy they might be. However, increased demand usually comes about when everybody is hunting for rides, so tracking down that open taxi might be easier said than done. It’s uncommon for surge prices to rise significantly without a lack of free cabs in the area. As a result, many Uber users choose to bite the bullet and pay the extra fare instead of trying to hail an elusive cab. 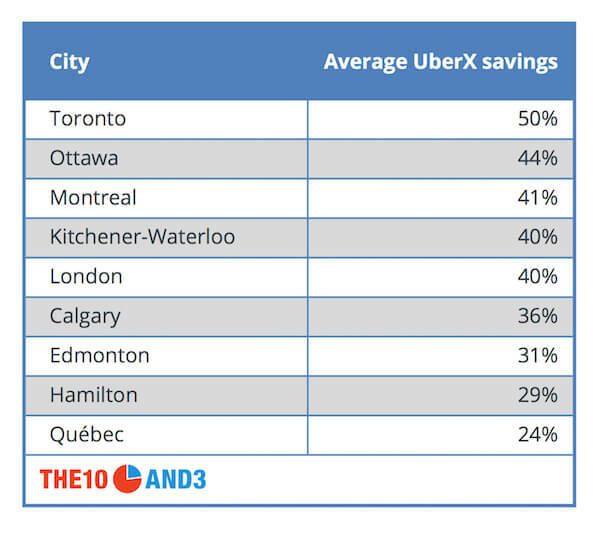 The 10 and 3 examined nine of the ten Canadian Uber markets. Halifax was omitted because the service does not have a reliable presence in the city, and does not (nominally) operate beyond a modest area within the municipality. For each city, four routes were collected, originating at the central PLVI intersection (for instance, King and Bay in Toronto); three of the routes ended at important travel points within the city (ex. the West Edmonton Mall, High Park in Toronto, or Universite Laval in Quebec), while the fourth went to the major regional airport. The Uber vs taxi savings were averaged across these four routes to get a city’s overall average discount. Cost for UberX and taxis for these routes were collected from TaxiFareFinder and Uber’s own fare estimates and pricing structure guidance. Costs are computed with the assumption of zero-to-low traffic levels. Taxi costs include a customary 15% tip whereas our UberX costs do not include an added tip (it is not possible to tip within the app and gratuity is generally considered part of the fare).